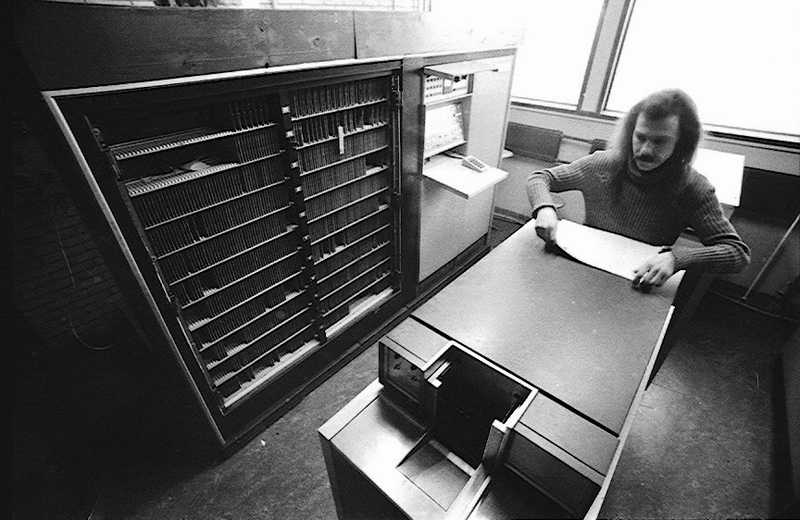 The Univac Solid State Computer 90, the software. 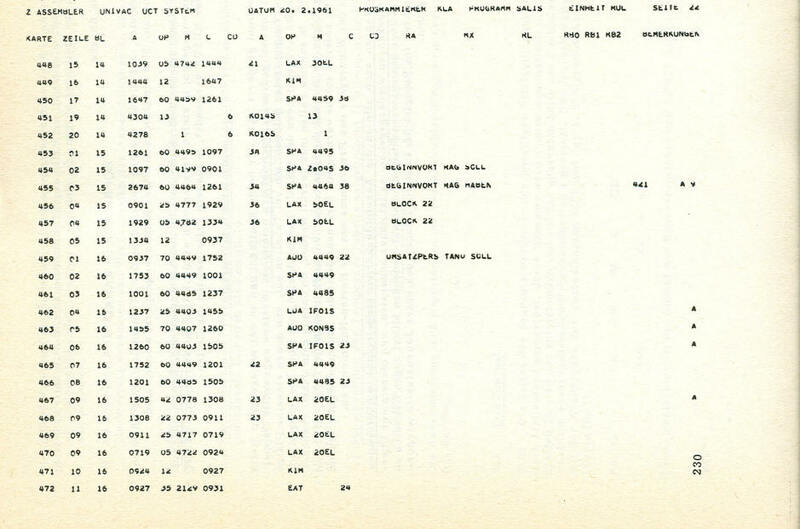 The program-list printed by the Z-assembler. 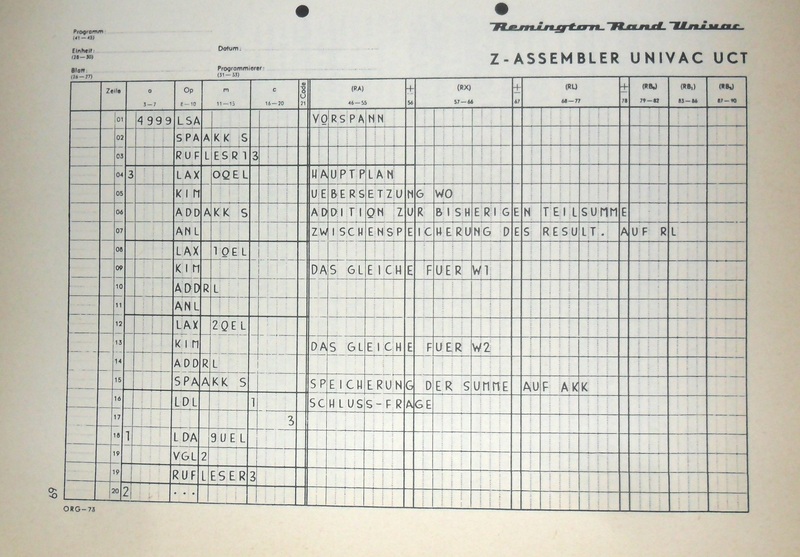 Programs were written in machine-code or in a simple symbolic language, called Z-assembler. to get a well defined documentation of their program. In this language the programs were written on standardized forms with symbolic instruction-codes and symbolic address-labels. The Z-assembler (the program) translated a symbolic program with labels and mnemonics into executable machine code. It produced a list with both symbolic code and machine code to allow debugging. and that the symbolic labels that interfaced with the standard routines, were recognized. Using the Z-assembler,also allowed different programmers to write together one executable program. Debugging was performed with the help of the program ARGUS. This program would scan the machine-code program in memory and detect interrupted program-sequences. with the executed instructions, the registers-contents and the used operand. These routines were loaded into the memory-space that was normally occupied by the I/O-routines. In special cases the debugging had to be performed by hand on the USSC, operating the CPU in the one-step-mode. one could load and run a separate routine that punched the program in machine-code into cards, each card containing 8 instructions. there was no stack or stack-pointer available on the USSC. A subroutine was called with an instruction in main-program like:   23 0400 1250. The subroutine was then entered on address 0400 and this 23-instruction was placed in rA. 0400 20 0402 0404 =  Perform  an OR with 50 on the 23 instruction code in rA, changing it into a 73 instruction. 0402 50 0000 0000 =  The constant. 0404 60 0499 0401 =  Write the 73 statement to the exit-address of the subroutine (in this case  0499). 0499 will then content 73 0400 1250. 0499:  73 0400 1250   (=jump to (C), (C) must be the next instruction of the main-program (the return address). Call the subroutine on 0400 and continue afterwards the main-program in 1250.
since the first return-statement would be overwritten by the second call.